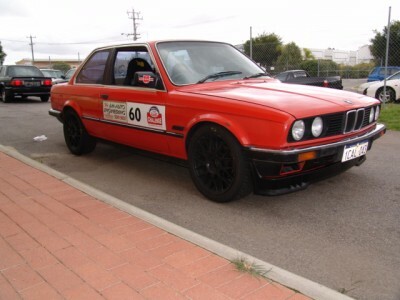 This sad E30 318i (k-jet) 1983 coupe has just been given a shot of steriods! Yes, now it will be a “CLUBSPEC” vehicle. Upgrading started straight away with the removal of the old m10 1.8 SOHC engine, solid front brake rotors, drum rear end, open centre diff and crappy 1 3/4″single exhaust. Now sporting the spare s14 2.3 engine, dogleg 5speed gearbox, bilsteins and eibachs, nylon offset radius bushes, 22mm front sway-bar and twin 2.25″ exhaust system and Sparco race seats ,Now that’s a nice upgrade! Do I need to say the car is “lite”, no sunroof, no electric windows, no air cond bits, not even a radio! a real “Poverty Pack”….. do I dare call it “bunkie” anymore? This fantastic car has now been sold as a rolling shell. A new larger engine install is planned by the customer(we want to see that!) having just learnt this car was crushed at the scrap yard!…….Sad. Brakes: upgraded to standard e30 325 brakes front and rear. Suspension: bilsteins and eibachs, nylon offset radius bushes, 22mm front swaybar. Bodywork: 1983 318i 2 door.